Jurassic Park is the first film that I ever saw multiple times in the theater. It’s one of those few movies like Alien and Raiders of the Lost Ark that blends a creative story, a certain level of cool (Humans, dinosaurs and technology? Neat! ), and an effects team that didn’t take “impossible” for an answer. I bring it up because I didn’t mind the toys, games, shirts, and assorted marketing crap that flooded the years around its release. I didn’t blow this game off simply because I’ve had too much of The Park, and hopefully you won’t either. The Genesis game, developed by Blue Sky Software (who also covered Joe Montana Football and Vectorman, truly bookending the Genesis’ lifecycle) departs considerably from the SNES and PC versions. It’s a standard side-scrolling adventure through levels based on scenarios in the film and book. 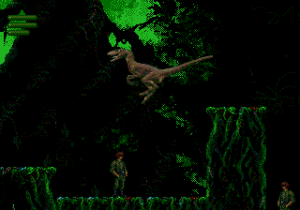 You play as the film’s hero, Dr. Alan Grant, in the main game, but can also select to play a different set of levels as a velociraptor out to eat him. Grant’s levels begin after the T-Rex mangles his jeep and tosses it deep into the jungle. Grant must work his way around the island and back to visitor’s center to escape. 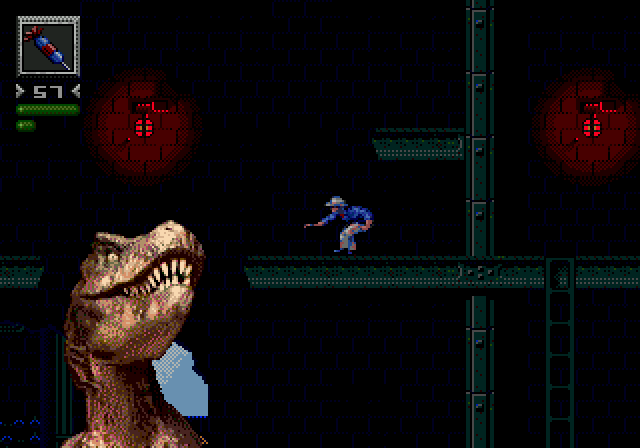 Typical platform hazards stand in his way, including deadly drops, electricity, spiked plants, and falling rocks, as well as about six types of hungry, hungry dinos. You’ll even use a few, namely the triceratops and brontosaurus, as platforms themselves. 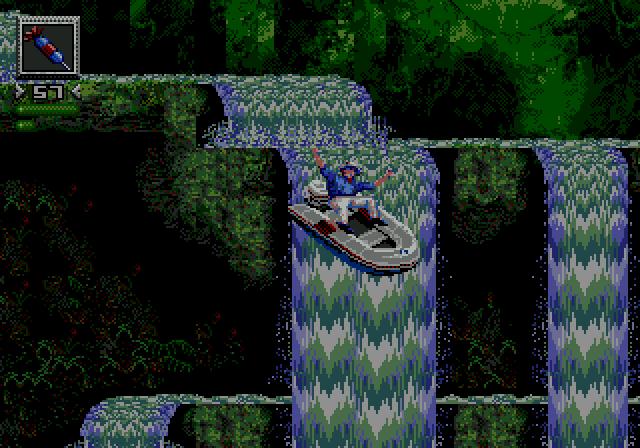 Levels mix up nature and technology nicely, forcing you to travel through a power station, sewer, jungle, volcano, and a pretty excellent river level where you must ration gas and use an inflatable boat to proceed downstream. Running, jumping, and climbing make up the majority of the gameplay. And of course, shooting. But the trick to this version is that all of Grant’s weapons only stun his dino foes (odd, since you can kill them in the SNES – I’d expect those to be reversed). You’ll have a wide variety of devices to knock them into a stupor; two darts of different strengths, various grenade types, a chargeable cattle prod, and stunning rockets… yes, stunning rockets. It shakes the gameplay up a little bit because it requires you to always be on the move. You’ll have to pop a dino in your way and keep running before they wake up, or manage your weapons to save your stronger, faster-acting darts for tougher hides. The raptors in particular can get nasty. Most dinos stay very close to their start points; many actually never move from them, but raptors will give chase along multiple platforms if you don’t hurry away from where you dropped them. Dinos also appear to wake up pissed and stronger than before you drugged them, and again, raptors show the most aggression upon repeated awakenings from dreamland. Grant’s fairly easy to control. Running and shooting are rarely problems, though jumping will cause some headaches. Any forward motion combined with jumping has a tendency to send him flying through the air like Carl Lewis going for the long jump record. I would cringe every time I was required to land on a short, rock-sized platform or do anything that required precision because Grant launches around so easily that it almost seems like a bug. Likewise, he automatically grabs the edge of any ledge he passes, though his reach is awkwardly long. Basically, if you come anywhere near a ledge, you’ll hop up on top of it. This can cause problems when you actually intend to drop down into a hole. If I could sum the whole experience up, I’d use “floaty physics” as the term. With only three lives for the entire game and passwords, but no continues, this can get pretty hairy. You can tell by the length of the Raptor’s game that it’s meant to be a bonus. And as long as you’re not expecting a complete part of the package, it’s an amazing bonus. The Raptor you control maintains all the abilities of the AI ones chasing Grant, including pounces, incredible jumps, bites, kicks, and even two types of screams triggered by button combos. You can eat small dinosaurs for health, leap and haul yourself up to higher ledges, and open doors – you know, because the movie said they were smart like that. Puzzle solving somewhat exists in the form of pushing crates around with your snout, and the fact that going claw to toe with security guards generally gets you laid out (encouraging you to avoid them). Even with these considerations, the Raptor’s game is noticeably faster and easier than Grant’s, and you can literally run your way through most of the areas. You can even leap along enemies and kill them without breaking stride, basically raking your claws along their backs as you pass overhead. However, the Raptor’s levels are also noticeably shorter. They’re distinct versions of the levels and themes in Grant’s game, not simply swapping characters. Still, most of these architectural changes are just to widen the areas for the Raptor’s greater bulk, remove complexity to allow you to maintain some speed, and to remove the puzzles. You’ll get a unique set of passwords for the Raptor game, and a unique story with different text crawls introducing the level, but you could probably burn through the Raptor’s game in 20 minutes. At least you’ll be having fun doing it, and while these levels are not the focus, or even equivalent to the main game, there’s still been a lot of care put into them. Graphics are an attractive blend of hand-drawn work and digitized photos. Many of the dinos, especially the Raptor and T-Rex, appear to be from photos of miniatures. Most of the backgrounds are detailed art. Vines and trees show through the misty green of the jungle. Dim red lights and concrete make up the power and sewer bunkers. Water currents and specific puzzle items like switches and valves are easy to spot, as are environmental dangers or hazards. You can look up and down a respectable distance by holding either direction to scout ahead. The visitor’s center is a great platform version of the style of the film, and both characters will spend time on the hanging dinosaur bones in the lobby. Everything both matches the style and mood of the film, as well as creating appropriate settings for the game. Framerate can be spotty as you go along, especially when either character is flying through the air, but that’s about the only downside. Dinos sound authentic, and the ambiance of every level is just right. Weapons seem to replace sounding powerful with just sounding loud; in fact, the entire game blares higher than usual. Music is not from the film, but each piece sets the tone reasonably well. No complaints in this department. The Jurassic Park craze has undeniably wound down by now, so this will just be another platform game to modern audiences. Still, the elements that made the movie great do carry over into the game – the sense of adventure, the fear of trying to bypass giant, deadly lizards – and it even manages to create some its own with the just-plain-fun Raptor levels. Not a bad choice if you want a platform adventure, with love of dinosaurs not required. Digitized dinos. Classic platforming. You can indeed play as the Raptor. Raptor levels are short. Some crazy jumps and physics.